The final race of the Round of 8 for the Monster Energy NASCAR Cup Series playoffs resumes Sunday (Nov. 11) with the Can-Am 500 at ISM Raceway in Phoenix. The green flag flies Sunday at 2:30 p.m. ET on NBC. Here are a few drivers to keep an eye on for Sunday’s race, courtesy of Frontstretch.com's Corey Brewer. Once news broke Wednesday the No. 4 team failed post-race inspection following its win at Texas Motor Speedway, Harvick's title hopes took a hit. The Stewart-Haas Racing driver will be without crew chief Rodney Childers (along with his car chief) for the remainder of the 2018 season. He was also docked enough points to bring him down to only three above the cutline going into Sunday's race. Busch is just slightly below Harvick on the list of favorites to take the checkered flag Sunday. He'll also be a strong contender. Chase has three wins this season and is also carrying some momentum into the final two races. Another top-five performance would go a long way for this race team, Chevy's lone hope to make into the Championship 4. The No. 20 team also failed post-race inspection at Texas following its fourth-place result. That will leave him poised to bounce back and show his late-season success after getting knocked out of the NASCAR postseason hasn't been a fluke. In three starts at this one-mile oval, Suarez has two top 10s. 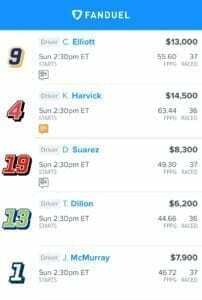 That's a similar track history to teammate Erik Jones with one big difference: Suarez costs nearly $2,000 less on FanDuel. He could be a sneaky top-10 play this weekend and I wouldn't miss out.